As the crisis in Southern Cameroons intensifies, the American administration and its allies are working behind the scenes to bring the Yaounde government to order. 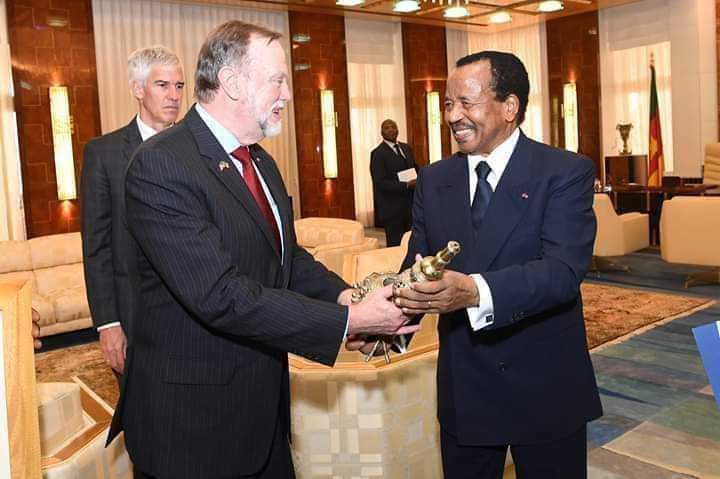 The U.S. Assistant Secretary of State for African Affairs, Tibor Nagy, who is on an official visit to the continent has been sending a very clear message to the Biya regime, urging it to embrace dialogue or face the consequences. Before arriving Cameroon, Mr. Nagy had said the Trump administration clearly felt that the Southern Cameroons crisis that has put the country in the spotlight for all the wrong reasons was an incident that required global attention. Mr. Nagy who had visited other African countries is currently in Cameroon and will be meeting with the country’s president, Paul Biya, to whom he will be delivering a warning from President Trump. The Trump administration is threatening to impose asset freezes and travel bans on Cameroon government officials if they do not halt the reckless killing of innocent Southern Cameroonians. A source close to the Yaounde government has indicated that there is panic in Yaounde and that Mr. Biya has called on his collaborators to change their language vis-à-vis Southern Cameroonians. The source, which elected anonymity, says the American position is being taken seriously as it has the backing of Canada and the United Kingdom which have been seeking to help bring about peace in Cameroon. With Mr. Nagy in Yaounde, the language has begun changing. The first to set the tone is the country’s defense minister, Joseph Beti Assomo, a staunch supporter of war and a huge beneficiary of the chaos playing out in Southern Cameroons. Mr. Assomo, on Monday, 18 March 2019, urged army soldiers to stop terrorizing civilians, a clear indication that the message from America and its allies has gone through. Mr. Assomo who is in Buea to install some military officials; all of whom are from his region, advised soldiers to collaborate with the population to normalize things in the troubled region. – Colonel Ateba Leonard Josue, as Regional Delegate of Ex-Service Men. The newly installed official also warned soldiers in the two English-speaking regions to guard against terrorizing the population. The Cameroon Concord News Group’s editor, Kingsley Betek, who is currently in Yaounde, will be providing a detailed report on Mr. Nagy’s visit to Cameroon. Stay tuned for any updates from your trusted online news platform. ‹ France-Afrique: Several killed as gunmen storm Mali army base	› Should we worry about genocide in Southern Cameroons?